Requirements engineering is the name given to the approach by which we ascertain, understand, and document the requirements of the business, users, and other stakeholders. This enables service design to understand what is required and ensures the traceability of changes to each requirement. The aim is to be able to produce a rigorous, complete requirements document. All requirements need to be agreed with the business. Problems with requirements engineering include insufficient time or budget to ascertain requirements accurately It is the responsibility of design coordination to set the standards and methods for defining requirements and ensure that they are followed during the service design stage. 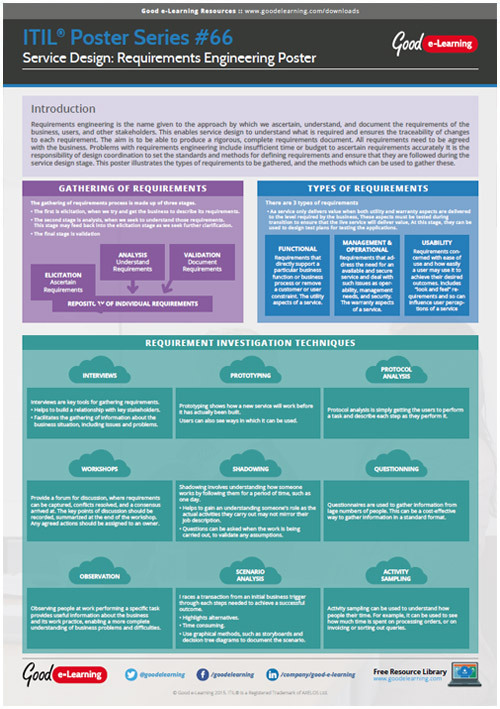 This poster illustrates the types of requirements to be gathered, and the methods which can be used to gather these. If this ITIL resource interests you, why not view our range of ITIL courses? Or view our full library of downloads covering a wide range of subjects and domains!